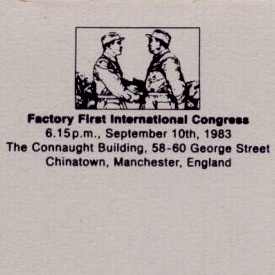 Notes: The notepaper is a sheet of A5 grey paper with black printing, saying "Factory 1st International Congress, 6:15 pm, September 10th 1983. The Connaught Building, 56-60 George Street, Chinatown, Manchester, England - Fac 81". See also: FAC 301 Factory Conference 'Think About the Future'.